He has often been dubbed as the ‘Dream Boy of the Youth’. Though he did not win the Superstar crown Shihan Mihiranga Bennet became the most popular music icon among all the young vocalists who have taken part in the reality shows related to singing in Sri Lanka. Throughout the ups and downs of his journey towards fame and fortune Geshni Clementa Silva has been by his side. She finally came to the limelight as the couple tied the knot nine years into their relationship. Shihan always keeps his profession and family life apart from each other. I think that is a very positive thing because we get his full attention when he is with us. When he handles something that has to do with music, he gives his full concentration to it. Shihan performs his duties as a husband and father very well. He helps me keep our house neat and tidy whenever he is at home. He also handles matters which concerns the boys. He does not laze around and let me do my thing if he is at home but always takes part in whatever I am engaged in. He is especially good at cooking. So at times he handles matters in the kitchen. Whatever he whips up are really yummy. I believe that it is bit of everything which made Shihan succeed. Everything from the way he dresses to how he performs has gained him celebrity status. His voice is exceptional especially because it has the ability to touch the hearts of music enthusiasts. Shihan and I met each other while we were schooling at De Mazenod College, Kandana. He is three years senior to me. He told me that he has had a crush on me from childhood. However he revealed his feelings only when I got into my G C E O/L classes. It was one of his female colleagues who told me about Shihan’s feelings towards me for the first time. I acknowledged it with an ‘ok’. Once he got the green light Shihan got permission from both parental parties and we got into a relationship amid their blessings in 2003. Nine years later we tied the knot in 2012. I was able to form a good judgment about Shihan because our relationship lasted for such a long time. Surprisingly we had different interests. However once we began living under one roof I began to like some of the things which interested him and vice versa. We actually did not go out with each other till around two or three years after I left school. Shihan became a household name at that time. He was recognized everywhere he went. Therefore we could not go out and speak to each other much since people would recognize him and become curious. He would visit my place most of the time and that is how we got to know each other. We did not tell about our relationship till we decided to get married. 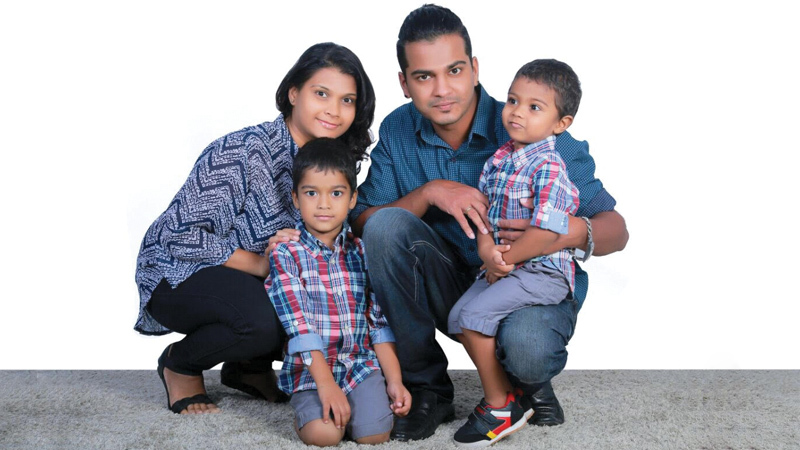 Shihan’s mother, Nilu Mallika, wanted to go and stay with his sister, Shanika, in Australia for a year. Since he believed that it was the ripe age to marry he decided to take the plunge rather than wait for another year till his mother returned. He popped the question and we got ready in about two weeks for the wedding. It was a simple church ceremony. We both wanted a small wedding because there were too many people to invite if we went for a grand ceremony. We got married on January 26, 2012, at Nayakakanda Church in Handala. Both our sons’ first name is Shihan. It is something we decided on before they were born. The eldest, Shihan Klein Marsh, was born in 2013. He is four years old now. The second, Shihan Kennan Yaash, was born the following year. He is three years old. We call them Marsh and Yaash. If we had gotten a daughter she would have been named after me. The boys are also into music at such an early age. We have gifted them with a guitar and they spend most of their time playing that and singing. Shihan faced a lot of enmity and threats during the time he was at the height of his popularity while taking part in ‘Sirasa Superstar Season One’. I gave him the full freedom to do what he wanted during that period. I did not cling onto him because that was a testing time for our relationship as well. If Shihan was the sort of person who would abandon me for his new found popularity then I wanted him to take that chance and leave me. But he did not do that. Our relationship stood the test of time and grew stronger. Shihan still relates that one of the reasons why he married me was because I put no restrictions on him. Shihan also got some death threats while he was taking part in the program. He did not reveal many of those details to me. I found out about them only after the storm has passed. He has the strength to face such situations. Such things do not scare him. If he has something to say to a person he says it to his or her face. I believe that many people who opposed him began to like him due to these qualities. In my opinion Shihan is equally talented in all three fields. It is the whole package which made him what he is today. Though he has sung lyrics penned by others to melodies composed by another, I think his uniqueness comes from doing all three together. It has been about nine years since Shihan launched his last album ‘Dreamz 2 – My Life’. He stopped compiling albums because albums by artistes are usually available at Pettah even before they are launched. He was very disappointed about this and decided to refrain from making another album. However his fans have kept on asking for new songs so he released several solo tracks. His undying fame has mostly to do with fortune. People really love him for some unexplainable reason. Though he has not done an album recently he is still active in the field as he takes part in musical shows and programs. He composes music and lends his voice for others’ songs. His last solo track was Obage Mathaken which was launched a couple of years ago. There are several songs of his which I love like Sulangak Wela and Obage Mathaken. However my favourites are among some songs which he has composed but not released yet. There are several songs which he has done on behalf of other vocalists which I love as well. I really love those songs because the combination comes out very well when he sings, writes lyrics and sets the melody for a track. Whether Shihan is into romance or not depends on the time and his mood. He has given me surprise gifts in the past. He once composed a song especially for me on one of my birthdays. It is called Oba Dutuwa A Dine which was included in his first album ‘Dreamz of Shihan’. Shihan loves cooking. He has a dream of establishing a restaurant one day. He also loves gardening. He has a studio attached to our home and that keeps him busy. Shihan loves the pork curry that I make. He also likes to eat a lot of veggies. He is pretty much a rice and curry person. My taste in food used to be different. Pre marriage I used to be into junk food and Chinese. Now I too have taken a liking towards rice and curry. Dining out, we normally go for Chinese and Indian food. Shihan is very blunt. If he has something to tell you, he would say it to your face. That is the most positive thing about him. The worst would be his temper. He used to be quite hot tempered a few years ago. It was not easy to calm him down. If he gets irritated at me or something else I would keep my distance and let him be till he cools off. However in recent times he has tamed his temper. Now he rarely flared up. Fans have always been supportive towards Shihan. There have been a few minor incidents in which some of them have been over enthusiastic about him and had phoned him regularly. Now his fans even chat with me. They also phone to wish the boys on their birthdays too.